Cracow is the most beautiful city in the world - a place full of surprises, mysterious recesses and the omnipresent legend. If your path leads you to Cracow, you can be sure the city will offer you unforgettable impressions. The Wawel Castle, St. Mary’s Church, old passages, florists’ stands and pigeons. To its visitors Cracow offers what is best. And after you have got to know the Wawel Dragon, listened to the trumpet call from St. Mary’s Church and visited the splendid museums, you will think of a place where you could rest. There is a house, beyond all the noise of the big city, where you can rest in silence and family atmosphere. 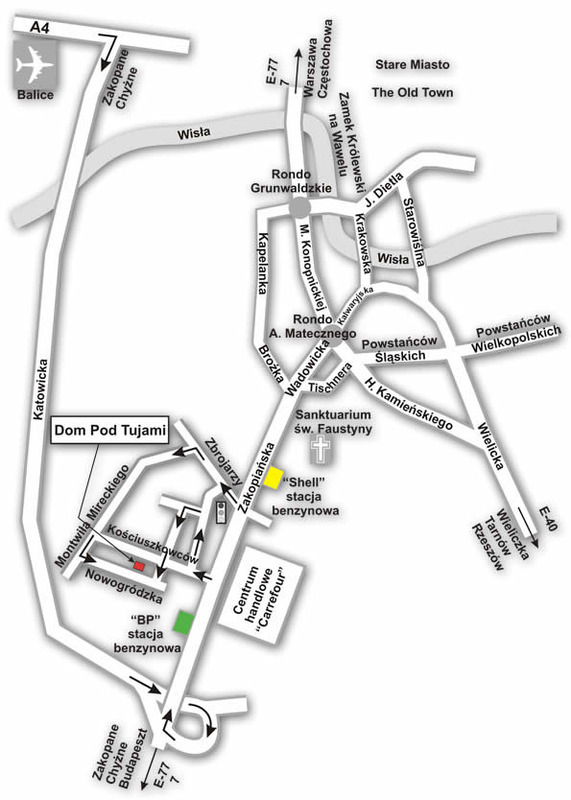 It is called Dom Pod Tujami (House under the Thujas). Our pleasant and cosy rooms - with or without separate bathrooms - are at your disposal; each of them with a TV set and other indispensable items. The price includes delicious, home-made breakfast. Your car will be safe in our own, private car park. In our House you do not need to speak Polish all the time - we also speak English, French and Russian. The House is located in a peaceful spot, which allows you and your family to rest and relax. If you wish, you can take a walk to the park, and in the summer - have a swim in the open-air swimming pool, located just in two minutes’ walk from the House. However, if your wish is to spend an entertaining evening, you can go to the eventful „Carrefour” Shopping Centre - to go shopping in the best shops, to play a game of bowling or drink the best coffee in Cracow. You can also relax in the garden around our House - the beautifully cut lawn, the water pool and the fabulous plants will make you want to come back here fast. We have many attractions to offer you - we can collect you from the railway or coach station and bring you straight here to our House. If you wish, we can organise trips to Auschwitz (concentration camp), Wieliczka (700 years salt mine) or Zakopane (Tatra mountains) at your request. You will travel there from our House comfortably and safely, and then visit the places with the best guides at your service. If you are thinking of visiting Cracow, think about us. Call us, and we will gladly prepare for your arrival, to make you feel at home in Dom Pod Tujami. The hotel is located 4 km away from the city center, 5 km away from the main railway and bus station. The nearest airport is 16 km away from the hotel. From the main railway and bus station: tram no 19 reaches the hotel, from the city center tram no 8 leaves for the hotel. From the main railway station : to get off on the 13th busstop "Solvay" in Falecki Borek. From the airport bus 192 and 208 leaves for the main railway station, next by tram 19. We offer our services for the transportation from the airport or the main railway station. We would like to inform our guests that we are ready to provide transport from the main railway and bus station for PLN 30 (1 way ride). From Balice airport PLN 70/ride.